This doc applies to Paypal Standard only. 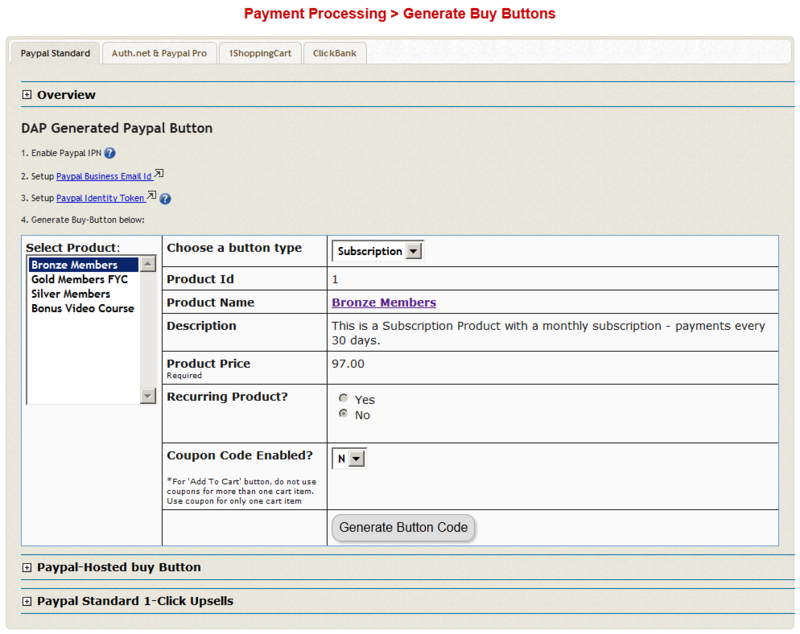 You do not have to log in to your Paypal account to generate your buy buttons. You can do it from within the DAP Admin Dashboard. 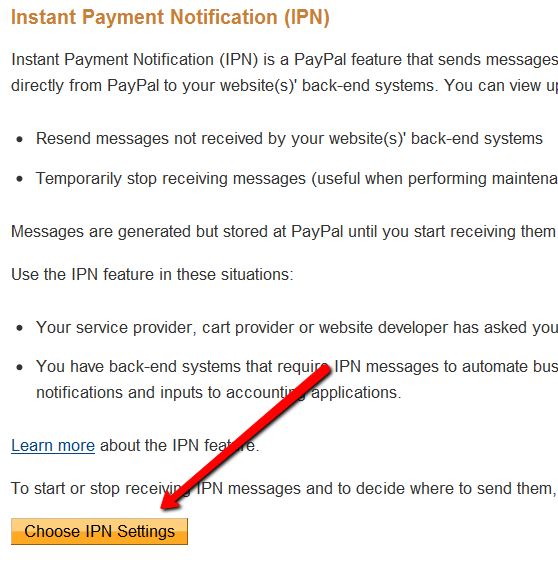 1) Enabling Instant Payment Notification (IPN) within your Paypal account. c) If IPN is already enabled, and you already have a URL in that field, then skip ahead to Step 2. Don’t forget to replace “YourSite.com” with your actual web site’s domain name. e) Make sure “Receive IPN Messages” is selected. Scroll all the way to the bottom of the page, and then Save the changes. Now you will see a long, ugly string of text next to the Identity Token field (see image below). Copy that string. Go back to DAP Dashboard > Setup > Config > Payment Processing > Paypal Identity Token field, and enter this string there, and save it. Go to “Setup > Config“. Click on the Paypal link in the sub-menu at the top. The current page will then skip to the “Payment Processing: Paypal” section about half-way down the page. Fill out items 1 through 5 only. Choose product for which you wish to generate the buy button, and then click on “Generate Button Code” button. 5) Publish generated buy-button code on your Sales page. DAP now needs to know where to redirect the user to. I plan to offer Free, Silver, and Gold package for which I have links to a series of 50 videos in total in the same page. Free package is for the first 15 video links; Silver for the first 35 links, and Gold for all the links. Now if I want to direct the buyers to the respective Logged-In URL’s for their chosen package, can I do that in the same page, or do I need to create 3 separate pages? You can direct them to the same member’s area page. If you create the member’s area page using the dap merge tag (%%USERLINKS%%) and direct all users to that page upon login, the users will automatically see only the products and the links that they have access to as DAP dynamically generates the list. I have generated a PayPal button from dap. And add to cart button. It works well, but if I select continue shopping, in order to select other products how do I return to the paypal shopping cart when I finished browsing? Is there any way to generate a “view cart” from DAP? I’m having trouble with my coupons with DAP Generated PayPal buttons. I created the coupon and activated it for the product I’m discounting. I created the DAP button with the coupon enabled and installed in on my site, but when I click on it, PayPal still shows the original price, not the discounted price. I’m also wondering how I can use these coupons with affiliates. For example, I have an affiliate who wants to sell my discounted product. Should I give her the code for the DAP discounted button or direct her visitors to a separate sales page on my site with the DAP discount button. Just an FYI since it took me about 30 minutes digging around PayPal… the above screenshots are out of date inside PayPal. Then click on “My Setting Tools” (fourth link under “My Profile” as of 04Jan12). Then to the right you’ll “Website preferences” click on “change” and then you’ll be able to proceed with the above steps for using DAP generated Paypal pay buttons. Thanks Alan. Yes, the screenshot needs to be updated to match the new Paypal settings. >>Im also wondering how I can use these coupons with affiliates. For example, I have an affiliate who wants to sell my discounted product. Should I give her the code for the DAP discounted button or direct her visitors to a separate sales page on my site with the DAP discount button. << Yes, you can create a code for that affiliate and share it with the affiliate or direct her visitors to a separate sales page that others dont see. I have a “buy Now” “non-recurring” product that has a “recurring” upsell product attached. The upsell product is free for the first 60 days and then billed each month. Can I use a 60 day trial period with $0 cost and then the $297/30 day billing? The credit card is already verified with the original “buy now” product and I don’t want to charge an additional $.01 for the upsell. I’m using DAP generated buy buttons with PPP. This is great! I’ve got it *almost* set up. I have one big question however. In the Sales Flow described above, how does the customer get added to the Aweber list? >> Can I use a 60 day trial period with $0 cost and then the $297/30 day billing? << Sorry, you can do $0.01 but cannot do $0 trial. >>In the Sales Flow described above, how does the customer get added to the Aweber list? < < After the purchase is complete, DAP will automatically create the membership account and if the product in dap is connected to aweber (as described here - http://www.digitalaccesspass.com/doc/aweber-integration/) , then dap will automatically notify aweber and the user will receive the aweber confirmation email in addition to dap thankyou/welcome email. I want to be sure I understand this. If I have one PayPal account, I can use that PayPal account and its IPN to sell from an unlimited number of websites on different domains? So there are no issues with the IPN pointing to http://abc.com but a sale coming from http://123.com or any other website? As long as the buttons that you use have button level IPN set, the global IPN (http://abc.com) will NOT get used so it does not matter what it points to. 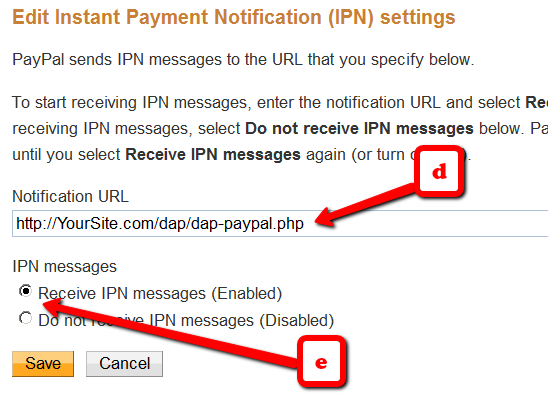 If you use dap generated button for paypal to sell or use paypal hosted button with button level IPN set or use any other buttons that uses button level ipn, you can have 1 paypal account to sell from an unlimited number of websites on different domains. If I leave the coupon box empty, the button works. Pls check if the coupon code has expired in the dap admin -> payment processing -> coupons page. Make sure the start date and end date are valid and also make sure the actual usage < max usage. If the settings are correct and it does not work, pls open a support ticket and we will take a look. It is worth noting — because I had a good bit of confusion on this point and wasted considerable time — that the DAP buttons do NOT support purchases via PayPal accounts yet. So if you want to support PayPal, you either have to have a PayPal hosted button only, or both a PayPal hosted and a DAP button on the sales page. Does that mean that a buy button generated by DAP will not work? I think you are talking about the dap shopping cart support for paypal but this post is not about the dap shopping cart. 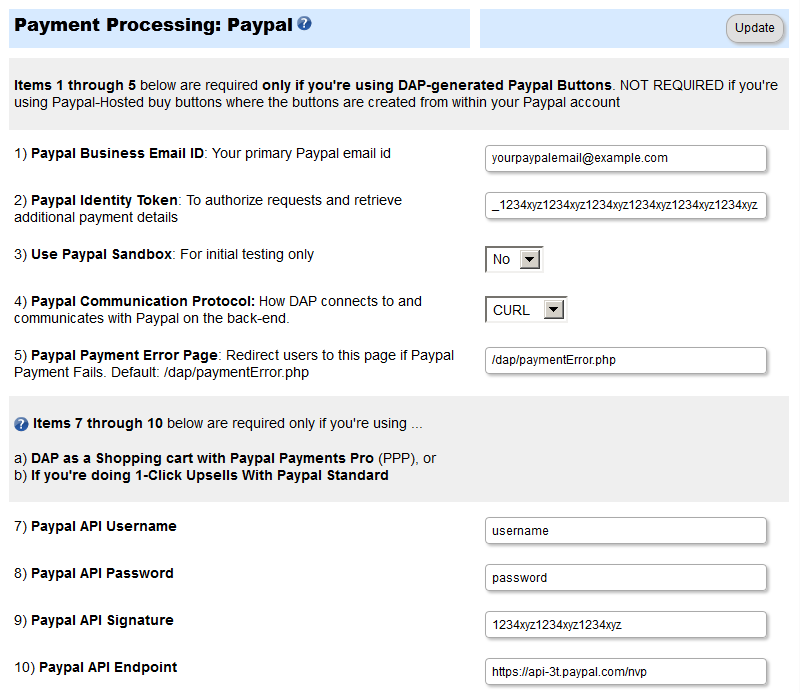 This is about the dap generated button for paypal standard and it does integrate with paypal standard. If you use the dap shopping cart (you need a Paypal Payments Pro OR Authnet merchant account to use DPA shopping cart), then the checkout page will only have CC option for buyers. If you want to add ‘Pay using Paypal’ option, then you can add that separately/directly on the sales page. You can have ‘pay with cc’ and ‘pay with paypal’ buttons directly on the sales page. The ‘pay with cc’ will be the dap shopping cart button and ‘pay with paypal’ can be what this post talks about (dap generated button for paypal). >>Does that mean that a buy button generated by DAP will not work? << Buy button generated by DAP does work. You can use dap generated button or use paypal hosted button for 'pay with paypal' option. You’re right, of course. And you describe the situation perfectly. I want ultimately to be able to use the DAP-generated buttons on the DAP cart because they give me auto-login for new users but for the moment I need to allow the PayPal payment option because many of my customers use it. I’m concerned two buttons will be too confusing for them. So I’m going with the PayPal-generated buttons for now. Sorry if my earlier comment was misleading. Is it possible to generate a paypal button in euros instead of dollars? And ideally generating a paypal button for both dollars and euros depending on our customer’s preference? Thank you! >>Is it possible to generate a paypal button in euros instead of dollars? < < Yes. You can update the value of currency_code tag in the button code. Thank you! What about if I need 2 currencies depending on my clients? Do I need to duplicate the programs in DAP? One in euro and one in dollars? 2 currencies for the same product or 2 different currency for different products? Is there a way to use a button I have already created? I would like to keep the button I have on my sales page and integrate that with the DAP shopping cart. If you want to keep the same button image but connect that to the dap shopping cart, then yes, you can do so. You can connect any button image to the dap cart. Select the button image location in dap payment processor -> generate payment button page (authnet / paypal payments pro tab). Is there a way to connect a particular shopping cart link to an existing button? I don’t have the image files for the buttons. They are embedded into the template design, but I do have the ability to paste a link to the button. Hope this makes sense. I can provide a link to my page if that is easier–I’d rather email it to you since I’m not ready to go public with my page yet. Just a question you mention to specify the paypal IPN set-up for the return URL. My question is what if we’re using this paypal account for different products? Will we be able to specify different return URLs for differnet products? Is there a way to add a small checkbox (like the one below this formfield) that the customer must “check” before they click the button and are removed to paypal? >> Is there a way to add a small checkbox (like the one below this formfield) that the customer must “check” before they click the button and are removed to paypal? << Sorry, not possible currently. Invalid Regular period. You must specify valid values for the A3, P3, and T3 parameters for a subscription. I have setup a $1 trial and then a recurring payment. Could this cause this error? You cannot do 1 initial payment + 1 recurring. You need to have atleast 2 recurring payments. What I did is to setup a recurring Membership with a $1 trial. When this trial is over does the system automatically charge the monthly fee for the regular on, let’s say for $27? Or has the subscriber to apply in the $27 Membership again? If so, why is there an option in the product which allows you to set up a trial? I don’t understand this. I didn’t mean that I have setup an initial payment. I meant that what I hve described above. >>When this trial is over does the system automatically charge the monthly fee for the regular on, let’s say for $27? Or has the subscriber to apply in the $27 Membership again? < < DAP will automatically charge the monthly fee based on your 'price&recurring' settings in dap products page => price&recurring tab. Yes it’s working because the trial amount is the same as the recurring amount. You can’t do 1 trial + 1 recurring if the trial amount is not the same as recurring amount. And you need to set the recurring count to 1.